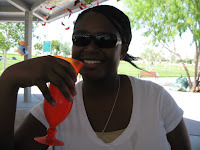 My company picnic was this past weekend. Jesse, Joel, & I went together. We brought beer, booze, juice, and sunflower seeds. I even brought my own cup. I did not bring the camera. This is a picture of me at the picnic. As you can see, I still spill whatever I eat or drink. The picnic was fun. The food was Mexican, the sun was hot, but the margaritas cool. There's not much of a story without pictures. We went, we ate, we socialized, and we relaxed. Afterwards we felt like a good summer had started. It's been a while since we had one. I consider a good summer to be one with lots of friends hanging around, nice weather, long drives in the sunshine, and new music. In Fargo, we drove out to the rope swing. There's Chris jumping off in the summer of 2003. Jesse took the picture before jumping himself. Even though I'm out of school, I still like to take a certain relaxed demeanor during the summer. And last Sunday I felt a little bit of that come back. Joel stayed over for a while. We listened to music, played cards, and ate sunflower seeds. And I was still in bed by 9:30... because it was a school night.